When I first reviewed this blog a while ago, it had been inactive for some time. Just checked it again, and there are three March entries. So, it looks like it's active again. Give it a try. 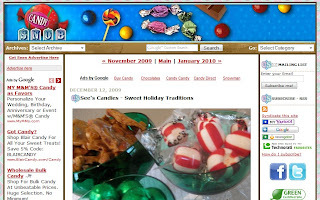 BLOG DESCRIPTION: A site for the candy obsessed - chocolates, gummies, jelly beans, and anything candy related.